Bell would normally sound on the half and full hour. Original cast iron weights included along with a brass key. Dial surround 14” wide, pendulum width 12”. Like all comtoise clocks, each strikes the hour, repeats about two minutes after the hour, and strikes the half hour on a large brass bell (the repeated hour strike allowed the owner to count the hour if in the field or elsewhere in the house). It is complete & original. The porcelain dial is mint with no hairlines. The brass surround stands 18 1/4" X 11". Having both its original side doors. Having a very large original bell. A really nice example. Excellent condition. One piece porcelain dial in almost perfect condition. The clock is missing the weights and front face hands. This type of clock was made without glass front. Besides the weights and hands this clock is complete and genuine authentic. It is complete & original. The brass surround has been removed on the bottom but as it is stands 16" X 13". Needing side doors. No pendulum or weights. It is complete & original. The porcelain dial has chipping around the left winding hole. The brass surround stands 16" X 9 3/4". Having both its original side doors. No pendulum or weights. All original and working, needs routine maintenance as it has been displayed unwound for over a year. Keys are provided. The French Morbier clock is known as a provincial clock, to distinguish it from clocks made in major urban centres, primarily Paris. This can be viewed by zooming in on the photos. Since the clock typically mounts high on a wall, the imperfections do not stand out. All aspects were functional with one exception, the pendulum would not remain swinging. One story has it that they were French country farm clocks. Since they could not be sure they heard the first ring in order to count the hours, the Morbier clock was made with a repeater bell strike that would ring again 2-3 minutes after the first ringing. A classic French provincial tall case clock from the 1880's has a hand painted pine case and is signed by the maker "Fco (Franco) Bosco a Tunis.". Colonial Tunis, the capital of Tunisia in North Africa, was considered a part of France. 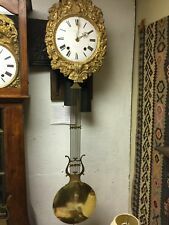 Antique French Morbier Clock Wag on Wall Circa 1870s to 1880s ! Not Running! Clock can be fixed ! If you have questions please ask! No weights! 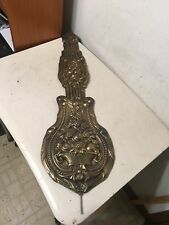 ANTIQUE FRENCH 2 WEIGHT 1850 MORBIER COMTOISE WALL CLOCK. COMTOISE MORBIER ROMANTIC SCENE 1850 - YouTube. French Morbier Comtoise Clock. The clock is from around 1850. Beautiful Decorated. This Wall Clock has a very beautiful but loud. ANTIQUE FRENCH 2 WEIGHT 1850 MORBIER COMTOISE WALL CALENDAR CLOCK. COMTOISE MORBIER WITH DATE CO28 - YouTube. French Morbier Comtoise Clock. The clock is from around 1850. This Wall Clock has a very beautiful but loud. GRANDFATHER MORBIER CLOCK French Empire 19th Century "La Comtoise du Brock"
Inscribed with 'Poilane A Beairne". It includes the pair of original led weights. It contains all it's working parts. WIDTH: 1.6 ft. (20 in.). ANTIQUE/ORIGINAL FRENCH MOVEMENT COUNT WHEEL ESCAPEMENT MORBIER/COMTOISE 19th. Brass suround childs playing with wheel type toy. In good condition: No parts missing or broken. One pivot side door used but present. Need to be cleaning and serviced. I left it that I found it. Brass suround peakock/birds. In good condition: No parts missing or broken. Need to be cleaning and serviced. I left it that I found it. Antique/original french. This clock was made in France. It is still in working condition although it may need to be adjusted when it arrives. 16” tall 10.5” wide 6” thick. this clock was probably made in the 1950s - 70s. This clock is in very good condition for its age. Brass Key for Morbier, Longcase, or Grandfather Clock 6mm. Condition is New. Shipped with USPS First Class Package. New Reproduction Morbier clock pendulum. New Reproduction Morbier clock pendulum. The chain is 35" long. The bob, rod and chain altogether weigh 8 ounces. Manufacturer SKU: B0561. Model: B0561. Very rare and very hard to find retired collectible miniature. Pre-owned in good condition. Product Line: Morbier. Features: This elegantlong-case design mirrors the rich curves of a classicContour style floor clock. Brass Key for Morbier, Longcase, or Grandfaather Clock 6mm. Condition is New. Shipped with USPS First Class Package. New Morbier Suspension Spring. The Manufacturer's Spring number is 308. 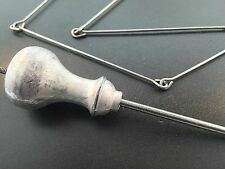 Vintage Hand-Made Key for Morbier, Longcase, or Grandfather Clock 6mm. Condition is Used. Shipped with USPS First Class Package. Any cord, when subjected to friction should possess reasonable resistance to abrasion. This braided nylon cord performs excellently in this respect. New Hermle, Kieninger, Morbier, Lyre Pendulum Suspension Spring. A dial cord is subject to friction whenever the set is tuned and must therefore possess reasonable resistance to abrasion. Nylon cord performs excellently in this respect. ANTIQUE FRENCH PAIR SIDE DOOR BACK PANEL MORBIER/COMTOISE 19th. Back panel Side door I left that I find it. One pivot broken. Antique french pair hands brass clock morbier comtoise parts or repair 19th. ANTIQUE FRENCH PAIR SIDE DOOR MORBIER/COMTOISE 19th. Side door 10 "83x5"31 (27.5x13.5cm.). All pivots are present. ANTIQUE SET OF 5 FRENCH IRON STAND MORBIER/COMTOISE 19th. Antique set of 5 french morbier/comtoise. COMTOISE MORBIER. Association Horlogerie Comtoise, France. An easy to use dictionary of all clock parts. drawings 3D: 6. size: 18 x 21 cm. pages: 16 full colour. 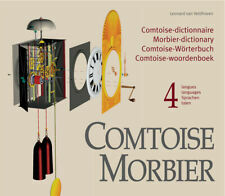 This booklet is a handy, 4-language (EN-FR-DE-NL) Comtoise-Morbier-dictionary, in which all the component-parts are shown in 3D-drawings. Specifically, it explains the background of social, political, economic and climatic conditions which were prevalent and which contributed to the unique evolution of this legendary clock. It was love at first sight. Sold for parts or repair, dirty barn find.